Comrade Jacob [Paperback] David Caute Panther Books; New edition (Dec 1973). Paul Lay writing in the December issue of History Today makes some excellent points regarding historical novel writing. I was particularly struck by this comment regarding the book The Daughter of Time by Josephine Yey “The historical novel when it is this good, this thoroughly researched, has become a means of legitimate historical inquiry.” David Caute’s book should be seen in this light. Caute has the reputation of being a novelist, playwright, and a historian. He is also a noted journalist and essay writer. He apparently uses the techniques of novel writing well and imbues his subject matter with his strong left-wing feelings, one writer said he “ brings a broad knowledge of European (mainly French) intellectual traditions into English fiction, he is one of the most intellectually stimulating novelists of recent decades in England--a "public" rather than a "private “writer”. 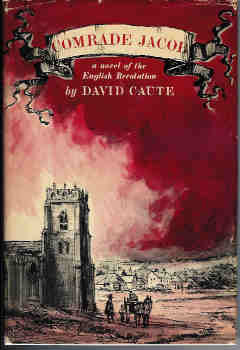 Caute’s novel is set in the high point of the English Civil War. A group of disaffected ex-New Model Army soldiers and others along with wives and children, led by Gerard Winstanley have become disillusioned by the course of the civil war under the leadership of Oliver Cromwell. The group decides to take over some land at St Georges Hill in Surrey. They plant crops and graze cattle to survive. Their mission was to develop and practice a primitive form of Communism. The settlement expressed in simple terms a growing disgust and protest by sections of both the lower middle class and sections of an early working class at the rapidly growing social inequality that existed during the civil war. Their commune was met with swift and violent punishment, and eventually, they were defeated. The fact that although written in 1965 the book and the subject matter still resonate today is that the issues that appear in the book such as the nature of democracy, social inequality and the rapacious nature of private property are still topics that provoke debate and civil unrest today. How else would you explain that despite the passage of nearly four hundred years people are still violently evicted from land for protesting at social injustice? In an article which could have described a scene 400 hundred years ago, the Guardian writer George Monbiot says this “Hounded by police and bailiffs, evicted wherever they stopped, they did not mean to settle here. They had walked out of London to occupy disused farmland on the Queen’s estates surrounding Windsor Castle. Perhaps unsurprisingly, that didn’t work out very well. But after several days of pursuit, they landed two fields away from the place where modern democracy is commonly supposed to have been born. At first, this group of mostly young, dispossessed people, who (after the 17th-century revolutionaries) call themselves Diggers 2012(1), camped on the old rugby pitch of Brunel University’s Runnymede campus. It’s a weed-choked complex of grand old buildings and modern halls of residence, whose mildewed curtains flap in the wind behind open windows, all mysteriously abandoned as if struck by a plague or a neutron bomb. The diggers were evicted again, and moved down the hill into the woods behind the campus: pressed, as if by the ineluctable force of history, ever closer to the symbolic spot. From the meeting house they have built and their cluster of tents, you can see across the meadows to where the Magna Carta has sealed almost 800 years ago”. As David Caute recently pointed out St George's Hill in Surrey is now home to some the most expensive real estate in England “Here opulent private properties sit untouchable behind security gates and surveillance cameras. It was not always so. In 1649, as the civil war drew to a close and Charles I stepped out on to a Whitehall balcony to face the executioner, the landowners of St George's Hill were confronted by an influx of nightmare neighbors, the so-called Diggers”. The novel is mostly told through words and eyes of Winstanley, part academic book part story. While the book unfortunately has been left a little on the shelf, the subject matter has seen a significant renaissance. It is only recently that a systematic study of Winstanley has started to emerge. The recent publication of his collected works is one indication of the trend to restore Winstanley to his place as one of the most prominent figures of the English civil war. The Diggers and Levellers were part of a group of people that sought to understand the profound political and social changes that were taking place at the beginning of the 17th century. They were the right ‘Ideologues of the revolution’ and had a capacity for abstract thought. While the Diggers were sympathetic to the poor, which stemmed from their religion they had no program to bring about social change, they never advocated a violent overturning of society. Their class outlook, that being of small producers, conditioned their ideology. At no stage did the Diggers or that matter did the larger group the Levellers constitute a mass movement. The contradiction between their concern for the poor and their position of representatives of the small property owners caused some tension. They had no opposition to private property, and therefore they accepted that inequalities would always exist, they merely argued for a lot of the poor to be made more equitable. Caute as was said earlier a man of the left and the novel reflects Caute’s academic upbringing as a student of Christopher Hill, as Caute says “I became acquainted with the Diggers in Oxford University tutorials with the great historian of our 17th-century upheavals, Christopher Hill, who at that juncture was severing his links with the Communist party in the wake of the Hungarian Revolution. Out of this came a novel, Comrade Jacob, published in the spring of 1961. But how to climb into the heads of Fifth Monarchists, Quakers, Ranters and the other mushrooming sects? We find it easier, surely, to understand the strictly secular doctrines of Jacobins and Bolsheviks. I divided the storytelling between Winstanley's own self-righteous narrative and scenes in which his actions and personality are viewed through a more skeptical authorial lens. Much of it was mere conjecture - the evidence is hazy. But this haze, which became the oxygen of the novel, was later lost in the film version”. After writing the book, Caute says he was approached by some people offering to make the book into film, But Caute stated that “The recurrent problem in these adaptations during the 1960s and 70s was the erosion of two central themes of the novel by the partisan passions of the New Left. Winstanley's mystical religious fervour went out of the window – he was always found on his feet rather than his knees. Also defenestrated was the rising personal power this opinionated prophet exercised among his poor followers, and how his "moral parsonage" may have entered his soul. In the stage and screen adaptations he was to be found striding out of a socialist realist manual, a clear-headed tribune of the people, a steadfast hero unburdened by the shadow of Esau. The lessons of Orwell's Animal Farm did not surface”. Perhaps the most famous “use “of Caute’s book is the film Winstanley by Kevin Brownlow and Andrew Mollo. Caute is heavily critical of some shortcomings in the movie. Having seen the film and read the book, I am in agreement with Caute. I like the film it has great merit and is stunningly photographed but as Caute said the religious/political aspects of Winstanley are heavily downplayed. When asked by Kevin Brownlow and Andrew Mollo, to use the book Caute said yes but only if he could write the film script myself. Caute bitterly regretted it and “discovered that screenwriters do not count for much. Not until I was shown the final product did I realize what had been going on. I duly withdrew my screenwriting credit”. Caute criticism was that Winstanley while being a “vivid commentary on the physical condition of 17th century rural England”, it was “reluctant to penetrate the strong religious motivations of the time. Winstanley believed that to know the secrets of nature is to know the works of God within the creation. This extends to the characters. I make no great claims for my novel in this regard, but it did attempt to convey individuals' sometimes perverse changes of mood and motivation. This is indeed retained in the person of the army commander, Lord General Fairfax, but Winstanley, the eponymous hero of the film, remains from start to finish a decent, upstanding, strangely well-spoken Left Book Club idealist. The rough edges of a Lancastrian, the spiritual torment, the mood swings between pride and humility, Winstanley's mounting confusions about God and Reason, have utterly gone”. The book also has its weaknesses. It should not be seen as a verbatim account of the role of the Diggers in the English Revolution. Caute only touches upon some significant events that could have been expanded without ruining the book. More could have been made of the Putney debates which are very briefly mentioned in the book. A detailed look at these discussions would have given a far broader and objective assessment of Winstanley’s role in the debate over the franchise. Caute could have also developed more the religious and more importantly political divide between the Presbyterian and Independents. It should not be lost that the people that sought the Diggers eviction were mostly Presbyterians; Lord Fairfax was after all heavily on the side of the Independents. But these are small points and should not detract from what is an excellent example of the historical novel genre. 3. The New Levellers 2012 from http://leejohnbarnes.blogspot.co.uk/2010/09/new-levellers-update.html (21st Century British Nationalism -Cognitive Dissidence, The mechanism of warfare and subversion for intellectual revolutionaries.) This is a very right wing article and should be read with some care. Howard Brenton’s short play deals with the 55-day military coup in the mid-1600s when Oliver Cromwell's army took control of Parliament and moved to put King Charles I on trial for treason. The book works on many levels. While just shy of one hundred pages it nonetheless is a substantial historical work. Brenton is correct to centre the play on the relationship between Charles I and Cromwell. Brenton’s heavy emphasis on the struggle of Cromwell to reach an agreement with the King is to a certain extent accurate but I feel Brenton takes a few liberties with historical record. Some reviews have correctly picked up on the point that Brenton uses the past to make an analysis of the present. Like a Bertolt Brecht play, it does shows the conflict between theory and action, as individuals and parties debate the future of the sovereignty of parliament. "But the real pleasure lies in seeing a pivotal moment in English history presented with such fervent dramatic power." The book like the play itself is demanding and it is very useful if not advisable to have at least a working knowledge of the civil in order to not only understand but enjoy the play. As one critic put it “if you do a bit of homework first, this is an evening that really grips." To my mind the play is historically accurate. It correctly portrays the differences that existed over the judicial murder of a king. Brenton is clear on the point that the killing of the king was a necessary step by the bourgeoisie to clear the way for its rule and establish a parliamentary democracy. The play is objective in the sense that Brenton makes us see two sides of the war. Another surprise is the inclusion of the Levellers especially in the form of John Lillburne (who was one of the most articulate theoretician of the English revolution). With current historical revisionism holding sway the Levellers have largely been expunged from historical record. Although Brenton's play could have developed Lilburnes opposition to the regicide more deeply. The play at the Hampstead theatre has come into criticism for the use of modern dress. Charles is suited with a Vandyke collar and cane, yet others like Cromwell are dressed like something out of the 1940s. Some critics have said this is so to emphasize the middle class nature of the revolt. Again the emphasis made by reviewers on the class nature of the English civil war again goes against modern academic historical interpretations. It would be interesting to note if current historians of the subject have reviewed the book and play. I feel a different interpretation would be forthcoming. Perhaps the most important and historically significant part of the play is the meeting of the two main protagonists Cromwell and the King. The scene is invented as the two did not meet during the trial. Although they did meet once, before the Civil War. Cromwell was in a Parliamentary group that went to Charles with a petition. I am not against a counterfactual arguement or the use of artistic license. Schiller, used it to tremendous effect when he invented a meeting between Elizabeth I and Mary, Queen of Scots, Brenton adds a fictional scene in which Cromwell desperately tries to persuade Charles I to save his life. The problem I have is that Brenton portrays his characters too much as individuals and not really in the context of the time. While it is true that Cromwell may have wanted a compromise with the King at an earlier time there were larger objective forces that were moving Cromwell at this time. Cromwell was enough of a politician to know that at that moment to move against the army which was the most radical force in the country would have been suicidal. The army was far to the left of the Levellers who at that stage were the revolutions left wing. On the Nick Hern Books website Howard Brenton wrote this piece entitled: A forgotten revolution – the historical context to 55 Days. Brenton “provides an insight into the pivotal, tumultuous historical background to the drama, and the men who embodied it… A LOST HISTORY. He goes on “recently I met a Frenchman in London and we fell to talking about the high drama of the climax of the French Revolution: the struggle between Danton and Robespierre. ‘In this country you don’t remember you also had a revolution,’ he said, adding, rather waspishly, ‘and you don’t realise you still live with the consequences’. I think this statement needs to be qualified a bit because it appears a little one sided and open to misinterpretation. It is true that the modern day English bourgeoisie does not like to be reminded of its revolutionary history. Some politicians have even gone as far as to deny a revolution took place. For them a much better revolution was the 1688 Glorious revolution which was little more than a coup de etat should the main revolutionary moment in English History. The other side of this arguement is that the subject of the English revolution has seen a significant outpouring of books from numerous academic institutions in fact not a day goes by without a new title being produced. Like many other aspects of the history of the English Civil War, its impact on society, politics and the economy has caused serious disagreements among historians. While a substantial minority (albeit in the past) have said it is impossible to ignore or deny that the civil war did have some impact and that changes did occur in the social, economic and political superstructure, others have played down appreciably the consequences and some have even tried to deny that social changes were crucial partly determining the outcome of the war. Certainly, over the last quarter of a century, it has been highly fashionable to question the social context of the civil war. In the book, The Causes of the English Civil War p117 Ann Hughes says this changing traditional fashion can be illustrated from the titles of two collections of sources covering early modern social history. In 1965 Lawrence Stone published Social Change and Revolution in England 1540-1640, whereas Barry Coward produced Social Change and Continuity in Early Modern England1550-1750. The coupling of continuity rather than revolution with social changes in the latter work reveals a more qualified assessment of the extent of transformation at the beginning of modern England. The New Social History of Historiography appeared in the early 1970s. According to some historians it was perhaps the last major historiography of the 20th century to try and explain the complex historical phenomenon known as the English Civil War. Before the 1970s, Social History had mostly been limited to a study of everyday life. During the last thirty odd years, the subject has come to prominence because some aspects of it have become the bête noir of some revisionist historians. The most positive side of the new history is that it brought into the public domain the lives of working people or the poor who had largely been ignored by historians. On the downside this, new history became divorced from any form of economic or materialist explanation of the civil war. This collection of essays comes predominantly from historians who in one way or another question the impact of the war with the sole exception of John Walters. This revisionist historiography has taken on many forms, but its primary component is hostility to any kind of Marxist historiography. Given John Morrill’s editorial role in preparing this collection of the essay, it is important to understand his take on these events. He was clearly influenced by the New Social History historiography in an interview he describes his attitude towards those historians who were in the forefront of the group “So there came along the new social history which opened up a whole range of types of evidence, and so one of the most important things to happen for my period was the work which is most naturally associated with Keith Wrightson (who trained in Cambridge, spent many years in St Andrews, returned to Cambridge and then moved to Yale). And the Wrightson revolution indeed, in the way in which social history is made, had an enormous impact on those of us who were more interested in high politics. I mean modern politics, constructed high politics. Wrightson’s importance for my work is again something that people might be a bit surprised to hear about, but I personally, in my mid-career, saw it as absolutely fundamental. In his introduction, John Morrill is correct to point out while there is general agreement amongst historians of what to call the events in France around 1789 or 1917 in Russia there is little agreement as to what to call the revolutionary events in 1640s England. A reader coming to these events for the first time will find out that this problem is down to many factors. A major one being the political bias of the historian. Another is the sheer complexity of the historical crisis that gripped the English state. The book is recommended in the sense that it does give the reader a broad range of differing views albeit absent is a Marxist explanation but more on that later. Chapter one is by Charles Charlton and called The Impact of the fighting. Charlton begins by assessing the numbers of dead and wounded during the conflict. Another ground for disagreement. Charlton highlights one of the biggest problems is that when dealing with primary sources regarding causalities these are open to bias depending on which side they came from? Taunton was according to Clarendon a third of the town was destroyed by fire, but according to Sprigge a flourishing city was all but destroyed. Some books have come out recently, which contain important sources of eyewitness accounts of the civil war. One such is J Adair By The Sword Divided highlighted one particular aspect which was the development of social advancement inside the Army and service in the armies of Parliament certainly provided opportunities for social advancement. At first, the rival armies were officered by men of much the same social status, but gradually new people from the middle, lower middle and artisan classed moved into positions of responsibility, both on committees that ran the war and in the wider army. John Hampden’s Shepherd, Thomas Shelbourne, rose to be colonel of Cromwell regiment of Ironsides and there were similar stories. The more conservative Puritan Gentry objected to their newcomers as much as on social grounds as on account of their often unorthodox or radical religious views. Suffice to say this is not Morrill’s position. Therefore I find his analysis on Puritanism a little one sided. Also, there appears to be an absence of struggle in Morrill’s chapter. Next, to nothing is made of the differing radical Puritan groups that were outside mainstream Puritan politics. This is the history of the victors as Christopher Hill would have said. Little is mentioned of radical sects such as the Ranters, who flourished in England at the time of the Puritan Revolution. While it is generally accepted that there was not a massive amount of unrest and protest during the civil war. John Morrill has made the point that changes in social and economic policy were mostly controlled by the middling sort and large-scale outbreaks were prevented by this class. However there was a tangible fear amongst sections of the middle class who feared the little people As Lucy Hutchinson writes with disdain, “almost all the Parliament garrisons were infested and disturbed with like factious little people, in so much that many worthy gentlemen were wearied out of their command, some oppressed by a particular sort of individuals in the House whom, to distinguish from the most honourable gentlemen, they called worsted stocking men”. Hutchinson is probably referring to the people that were increasingly being influenced by the Levellers who expressed an awareness, particularly amongst the lower sections that to have a say in these changes they must organize through some kind of political organization. “In the social production of their existence, men inevitably enter into definite relations, who are independent of their will, namely [the] relations of production appropriate to a given stage in the development of their material forces of production. The totality of these relations of production constitutes the economic structure of society, the real foundation, on which arises a legal and political superstructure, and to which correspond definite forms of consciousness. The mode of production of material life conditions the general process of social, political, and intellectual life. It is not the consciousness of men that determines their existence, but their social existence that determines their consciousness. At a certain stage of development, the material productive forces of society come into conflict with the existing relations of production or — this merely expresses the same thing in legal terms — with the property relations within the framework of which they have operated hitherto. From forms of development of the productive forces, these relations turn into their fetters. Then begins an era of social revolution. The changes in the economic foundation lead, sooner or later, to the transformation of the whole, immense, superstructure. In studying such transformations, it is always necessary to distinguish between the material transformation of the economic conditions of production, which can be determined with the precision of natural science, and the legal, political, religious, artistic, or philosophic — in short, ideological forms in which men become conscious of this conflict and fight it out. Just as one does not judge an individual by what he thinks about himself, so one cannot judge such a period of transformation by its consciousness, but, on the contrary, this consciousness must be explained from the contradictions of material life, from the conflict existing between the social forces of production and the relations of production”. Burgess believes that politics were fluid and that no one really stuck to their principles but ideas were mere "rhetoric." His examination of the different groups including radical groups guides his approach. He believes that the various political groups were largely acting empirically. Taking advantage of changes in the political situation with some rhetorical statements. This, in my opinion, does not explain the complex philosophical problems that were being tackled by people like Thomas Hobbes and Harrington to name just two. In Anti Duhring Engels said if Englishmen nowadays do not exactly relish the compliment they paid their ancestors, more’s the pity. It is none the less undeniable that Bacon, Hobbes and Locke are the fathers of that brilliant school of French materialists which made the eighteenth century in spite of all battles of land and sea won over Frenchmen by Germans and Englishmen, a primarily French Century, even before that crowning French revolution, the results of which we outsiders, in England as well as in Germany are still trying to acclimatise. Chapter V the Impact of the New Model Army. Ian Gentles develops an excellent introduction to the New Model Army. Chapter VI John Walters is a bit of a strange choice in this selection essays in so much as you would not classify him as the revisionist historian. In fact, he would be much closer to the Marxist historians. His work is always interesting and thought to provoke and this essay carries on in the same vein. Walters actually believes that the world was turned upside down. Walters examines large swathes of primary sources but like a good historian does not take them at face value. He recognizes that these are not impartial documents but were weapons of war. Significantly it is in this chapter that we get a real feel of the social turmoil that existed during the civil war. Walter’s believes that large segments of the population were becoming radicalized and became involved in all number of political and military activity.Riots broke out all over the place, and many of these reflected the level of poverty that existed. Walters believes that these disorders threatened the social order. Walters is the only chapter that women get a look in. While not examined in any depth Walters recognizes that large sections of the female population were being radicalized alongside their menfolk. 8. Cliff Slaughter From Labour Review, Vol.3 No.3, May-June 1958, pp.77-82. Transcribed & marked up byEinde O’ Callaghan for the Encyclopaedia of Trotskyism On-Line (ETOL).